First off, thank you for using one of our WordPress themes. We hope you enjoy it as much as we enjoyed building it piece by piece. Here you can find an extensive article on how to get started with your new theme, as well as some useful tips to get the most out of it. All the PRO themes are different from their Lite versions and you will have to install them. You usually find all the necessary information in the emails you receive from us after the purchase is completed. If not cannot find those emails go to this URL: https://cpothemes.com/account and login in with the email you used when making the purchase. From there you can download the zip files with the PRO themes. After you downloaded the zip file go to your website’s dashboard > Appearance > Themes > Add new > Upload theme > select the zip file > Install the theme > then Activate it. It’s that easy! CPO Content Types: Helps you manage special content such as the portfolio. CPO Shortcodes: Lets you insert multimedia elements into your content. CPO Widgets: Adds a number of useful widgets not included in WordPress. While these plugins are mostly optional, the most essential one is CPO Content Types. This is a free & lightweight utility that will allow you to manage all the special content in your site, such as the homepage slider or the portfolio. Without it, you won’t be able to use the full potential of the theme. You can also install CPO Content Types right from your WordPress dashboard, in the Plugins > Add New page. Simply search for CPO Content Types, and it will appear as the first result. This plugin does not need any additional configuration. Our themes are mostly managed through the use of custom post types. If you have installed CPO Content Types, you should see the various content types available to your theme in the main admin menu. Each one of these areas has an interface identical to that of posts and pages. To start adding content, all you need is to start creating posts in each category. Some content types such as slides or feature blocks will automatically be used in the homepage. 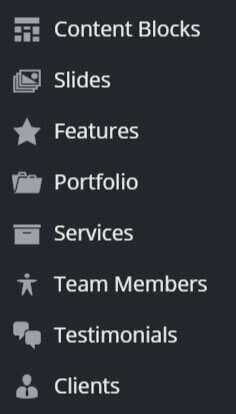 Other content types will need to be marked as featured, such as team members, portfolio items and services. You do not have to worry about handling the layout of your website. Your site will take shape just by creating these content types like you would do with static pages. After you have created them, you can head over to the WordPress Customizer to tweak the styling of your site. Read on! All premium themes make use of the WordPress Customizer to manage the various options and settings. You can go to Appearance > Customize, and then find all the additional settings that the theme gives you. The available options may vary from theme to theme but they are mostly standardized. For example, blogging-based themes that do not come with a portfolio will lack any options to change the portfolio layout, and so on.